#StakeholderEngagement is key to the success of projects, companies and careers. Get it right and you are much closer to success. Mess it up, and you are big steps towards failure. Effective stakeholder engagement is often difficult to achieve and maintain. It requires good strategy, systems, processes, attitudes and more. I’ll cover these in an upcoming blog but today I want to talk about mistakes. Stakeholder engagement is something I’ve worked on, designed, taught, supported and rescued in many industries and on every continent. Here are five mistakes that I’ve seen repeated many times, and often to disastrous results. 1. Defining stakeholders too narrowly. 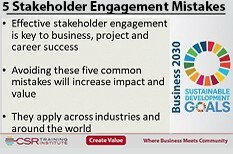 Too often key groups of stakeholders are missed and this means missed opportunity for companies and stakeholders. The group that I see missed most often is the international development community Agencies like the UNDP and development partners like Britain’s Dept for International Development (DfID) and the United States Agency for International Development (USAID), etc. These agencies are committed to SDG priorities such as education, health, poverty alleviation and gender issues, issues that are intertwined in most corporate CSR strategies and programs. When these objectives are shared with community stakeholders and the company it creates huge opportunities for synergy, collaboration and enhanced business and social impact. Unfortunately, many companies define their stakeholders too narrowly and miss these opportunities. 2. No balance between defense (compliance) and offense (strategic opportunities). It is not easy to maintain a balanced approach to compliance and developing strategic opportunities for stakeholder engagement and value creation. Compliance is important, but strategy is where you will develop high ROI and optimized business and stakeholder impact. 3. Going defensive too quickly. Community/stakeholder meetings, especially in the early stages of a project, often seem to start negatively with people lining up to voice displeasure and concern over one thing or another. For company representatives, especially senior executives, there is often a tendency to ‘correct facts’ and provide balance and perspective when faced with seemingly endless negative comments. I’ve been to hundreds of community meetings and the negative comments and complaints at the beginning are often more about local community politics and posturing than they are about anything the company has done or is planning to do. This isn’t to say that there aren’t often real and meaningful grievances and issues, just that the best approach to during early stages of a community engagement is to simply listen. I’ve found that by listening – and being seen to listen – as complaints and issues come out the energy will eventually shift and a constructive dialogue begins. Of course, it doesn’t happen this way all the time, but in general it is best to start every engagement with open ears and silent tongues. 4. Concealing self-interest. Let’s be clear. Companies engage with stakeholders and strive to create local value and benefits because the company sees that as being in their own self-interest. If they didn’t, why would they spend the time and money? Too often companies will try to position their engagement and CSR work as being more about the interests of local stakeholders – because the company is ‘good’. This creates an awkward donor/recipient type of relationship that undermines a company’s credibility. It also puts into question the ongoing sustainability of the company’s efforts. If a company positions its efforts as being only for the benefit local stakeholders then it makes the program very easy to cut from the budget if financial challenges arise. It’s far better to openly acknowledge self-interest and fully engage stakeholders when their interests come together. Identify, nurture and own the alignment of business and stakeholder interests. That is where value, impact and success can be found. 5. Communication. Too much, too little, too promotional, too simplistic. And often not disseminated in a way that will reach the intended audiences. Communication should be strategic, and should be used strategically – and, above all, don’t start bragging. These are the big 5. There are more. But if these could be consistently avoided businesses, projects and careers would be more successful. 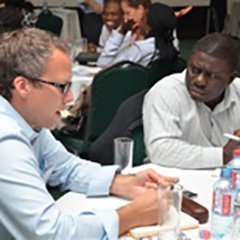 If you’re organization is interested in aligning your stakeholder engagement efforts with actual business results then we should talk about how the CSR Training Institute can help you achieve more. Contact us today for a complimentary 20 minute consultation.